Grains weaker this morning after yesterday’s bean rally. Wheat unchanged, corn down a penny, and beans down 6 cents. G20 Summit to kick off in Buenos Aires tomorrow. All eyes and ears on U.S.-China talks. China is hoping for "positive results" in resolving a trade dispute with the United States at a G20 summit in Argentina, the commerce ministry said, ahead of a closely watched meeting between the Chinese and U.S. leaders. Weekly US corn export sales are est near 400-950 mt, soybeans 400-900 and wheat 250-500. Wire story reports prices for U.S. ethanol fell to the lowest levels in 13 years on Wednesday, pressured by bigger-than-expected output and larger supplies of the corn-based biofuel; some traders had anticipated a decline in output. ERS researchers found that adoption of no-till, in general, increased from 2000 to 2007—particularly for wheat (2004-2009) and soybeans (2002-2006). 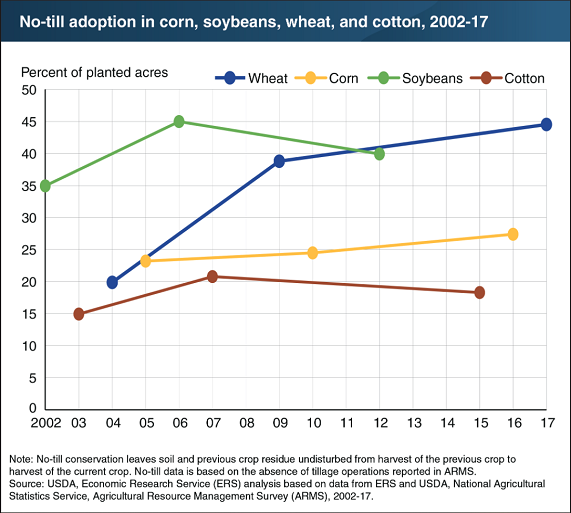 In later periods, no-till adoption increased more slowly for wheat (2009-2017) and may have declined for soybeans (2006-2012) and cotton (2007-2015). Data for corn indicate only modest gains in adoption of no-till between 2005 and 2016.